An insurance dispute held up the demolition of a house destroyed by fire for over a year. Unfortunately, this type of situation can happen. In fact, some disputes can last even two to three years or longer. Even more unfortunate than the loss of the home was the loss of two family members who died in the fire. 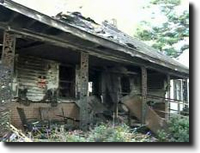 The following story was broadcast by WRAL News on May 7, 2008 – one year to the day they covered the original story about the fire itself. This story has personal affects on me as I was the independent appraiser for the insured in this case. WRAL News – The May 7, 2007, fire at 1884 Memorial Church Road, in Fremont, claimed the lives of Shannon Minshew and her 77-year-old, bed-ridden grandmother, Mayola Waddell. Firefighters found Minshew’s body on top of Waddell. She had been trying to save her, investigators said. “It’s horrible we have to see it (the home) every day, whenever we go somewhere,” said Minshew’s daughter, Brandy Hall, who lives behind the charred home. Other family members live next door and directly across the street. The entire family is fighting with Nationwide Insurance to get the house demolished. Nationwide declined to comment on the matter Wednesday, but Minshew’s family says the insurance company has not determined how much it is willing to pay on the property. Terrible loss from this fire – not only the loss of the home, but also the loss of two loved ones suffered by this family. My prayers still go out to them today. Funny is this comment by the family, “…the insurance company has not determined how much it is willing to pay…“. Willing to pay? How about the amount it actually costs to replace the damaged home – not a penny more, nor a penny less? See, this is the mentality of many insurance company representatives. (Notice how I said many and not all – some actually know the policy and how to execute it’s coverage. However, they are few and far between.) By stating to this insured that we have not calculated how much we are “willing” to pay, shows that they are not interested in paying what they owe, but rather how much they can save. How much can they offer to make the insured go away. As I mentioned, I was the independent appraiser hired by the insured on this loss. They had a public adjuster who could not obtain a settlement on the claim. Nationwide invoked the Appraisal Clause on February 11 2010 and I was named as the appraiser for the homeowners on February 19, 2009 – more than nine (9) months after the date the fire occurred. The dispute on how much it would cost to replace the damaged home continued into the appraisal where the court was petitioned to select a “competent and disinterested” umpire. In conclusion, the insurance appraisal process resulted in $36,800 more than what was offered by Nationwide Insurance for RCV and $49,732 more than Nationwide offered for ACV. The insured was also paid $14,900 more than there policy limit of $125,300. Certainly we have had larger appraisals where the policyholder has obtained “hundreds of thousands” of dollars more than the insurance company had offered. However, most would agree that no one would want to eat $49,732 to line the pockets of their carrier. For this family, it was about two loved ones, Shannon Minshew and Mayola Waddell, not about the property or the money. Anyway, I ran across the WRAL News story online while searching for something else. It reminded me that the loss of property can be replaced… However, loved ones cannot.